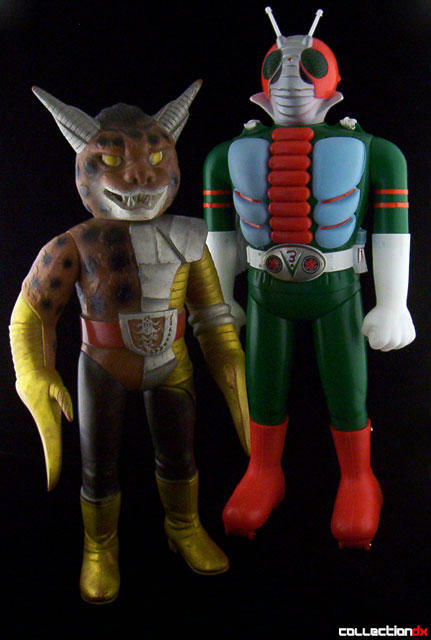 The villains from the TV show all combine an animal with some kind of man-made item. Hasami Jaguar is a jaguar with a giant blade on each hand and when those blades are combined, they form a giant pair of scissors. ("Hasami" is Japanese for "Scissors", hence...Hasami Jaguar = Scissors Jaguar). Hasami Jaguar was also able to transform himself into a Catholic priest as a disguise. 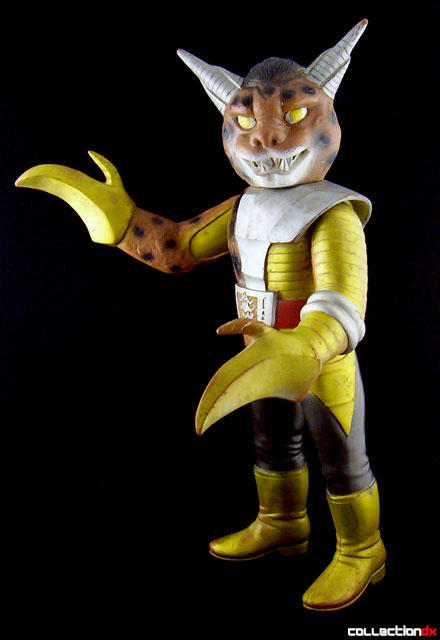 This toy was the first Jumbo villain I was able to get, and although he is probably my least favorite one, it was still a momentous occasion for me as I'd been wanting a villain for several years. Strangely, my next villain, Green Ghost C3, would be acquired just a week later. As with all the first series villains, Hasami Jaguar was originally intended to be a store display and is made entirely out of soft vinyl. He is at least partially handpainted and you can still see brush strokes on various parts of his body. 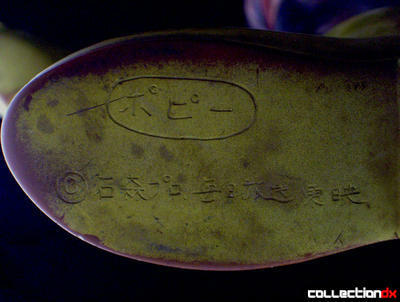 Name and copyright information is etched into the bottom of each of his feet so that shop owners would know who to display him with. 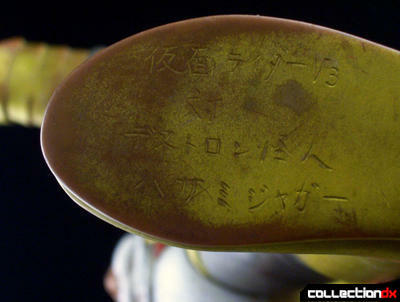 I really dont know kanji, but I do know that the left foot says "Kamen Rider V3 versus Destron "Mystery Man" (?) Hasami Jaguar" while the right foot says "Popy" and "Ishinomori Productions", something I can't read, and then "Toei Company". 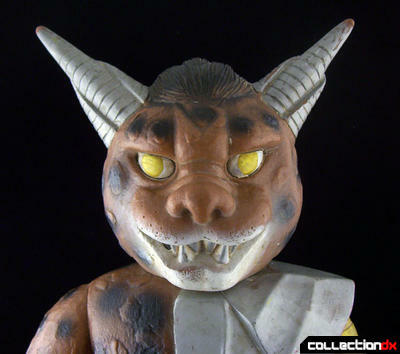 Like all Jumbo Machinder villains, Hasami Jaguar is not an easy toy to get. It's probably in the middle of the pack as far as rarity among villains go. It does show up from time to time, but almost always loose and missing the whiskers. I think if I had a perfect deadstock specimen, I might like the toy more. Though I'm not a huge fan of the character, it does look sharp when the paint is still shiny and perfect.